I’ll admit it, sometimes being a Christian can feel like being in a circus act. We must say the right things, do the right things, and think the right thoughts. Oh, and let’s not forget that joyful attitude we’re always supposed to have. This isn’t how it should be. And you know what? This is one of the major things wrong with modern-day “Christianity.” It’s the religion that preaches mercy for others while letting you beat up on yourself. This isn’t Christianity at all! So what happened? It’s simple–we forgot about grace. 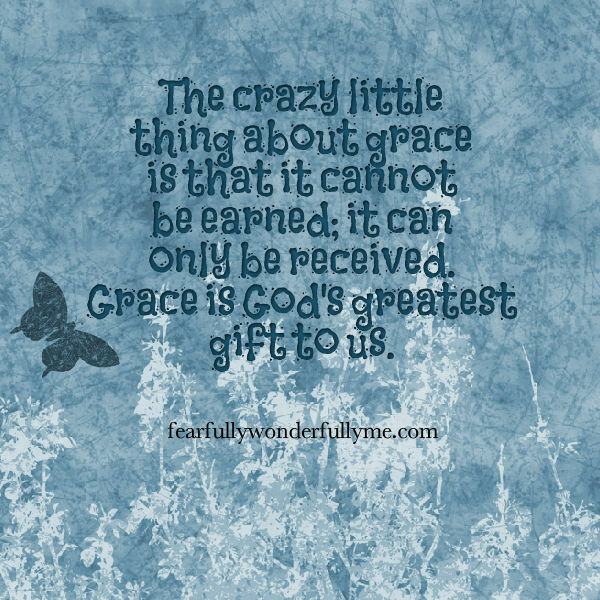 The crazy little thing about grace is that it cannot be earned; it can only be received. Grace is God’s greatest gift to us. Although we (hopefully) nod our heads and agree that we should extend this grace to our stumbling brothers and sisters, what about ourselves? I’m a perfectionist by nature, and I also struggle with anxiety. Although most of the time I am merciful toward others, I have a hard time forgiving myself. I, like a lot of people, place a lot of undue pressure on myself. I expect perfection and to be just like Jesus, only to forget that He is the only perfect thing in me. I forget that I’m allowed (and expected) to screw up. I forget that I have an Advocate in heaven who is quick to forgive me and lift me up when I stumble. My little children, these things I write to you, so that you may not sin. And if anyone sins, we have an Advocate with the Father, Jesus Christ the righteous. And He Himself is the propitiation for our sins, and not for ours only but also for the whole world (1 John 2:1-2 NKJV). I forget how far I’ve come in my walk with Jesus. One thing is for certain, this obsessive anxiety with being so good and perfect is not helping me in the least. In fact, it’s turning myself inward so much that I forget about God and the needs of the people He has placed in my life. This is exactly what the devil wants. And you know what? I’m not going to let this perfectionism and anxiety get me down. I’m going to rest in the grace of the Most High God, and I’m going to forgive myself for beating myself up. It’s time to let go and enjoy life. It’s time to be led by the Holy Spirit completely, instead of expecting to get the job done myself. It’s time to abide in the peace and joy of God’s love.